Like everybody else, I was hit with and then devastated by the news that Grammy-nominated rapper, entrepreneur, wealth- and community-builder Nipsey Hussle, aka Neighborhood Nip, aka Ermias Asghedom, was gunned down in front of his own store yesterday in Los Angeles. At 33 years old, no matter what the circumstances, he was too young to die. He is a father of two, sharing a son with actress Lauren London, who, along with his family and close friends, I’m sure is absolutely going through it right about now. I don’t know why deaths in the hip-hop community hit me especially hard. Maybe it’s because being a hip-hop artist is the one artistic profession where, in some corners, what got you there is likely the same thing that could easily take you out. To tell the truth, and knock on the proverbial wood, given the life stories and the tales many rappers tell, we’re probably lucky more rappers haven’t been taken from the planet. Nipsey wasn’t perfect. I’m 39, and the amount of growth I’ve personally experienced between 33 and 39 is tremendous. Part of that is my exposure and experiences with many people and also by learning from the people around me who I’ve had the pleasure to get to know. I’ve gained from them. Jay-Z at 26 when he dropped Reasonable Doubt versus Jay-Z who dropped 4:44 is an entirely different man. While he may have always had a hustler’s spirit, which enabled him to get where he is and obtain what he’s attained, what he’s learned along the way and how he views the world seem to be very different from 1996. Last year, Nipsey made a comment on Instagram under a picture of a group of black youth implying, amongst other things, that there was some gay agenda out there working against the black community. Basically, that images of blackness were violent, gay or fatherless, and in this picture was a group of young black men in tuxedos. I don’t know why that particular image stuck out to him in such a way to make him speak out in the fashion he did, but I do imagine and hope that anybody in his position, who was hoping to rebuild his community—one surely filled with the type of people he claimed the media was feeding us—would have realized that we’re all community, all looking for the same things he claimed to be hoping to bring to his community—freedom and opportunity. We’ll never know, so I get why there are people who aren’t happy that a black man was gunned down but aren’t shedding many tears for a person who otherwise didn’t want to acknowledge their existence. All of our faves are problematic. By all other accounts, Nipsey was literally doing what he could to build up the local community that raised him with his clothing stores, his barbershop, his restaurant, his STEM innovation hub, Vector90, and his presence there. Even his approach to ownership and economics is worthy of pride. Granted, selling limited edition mixtapes for $1,000 a pop seems insane until you reframe it and realize understanding your value and charging accordingly is how the rich get and stay rich. Plus, it actually worked; he sold the vast majority of them. 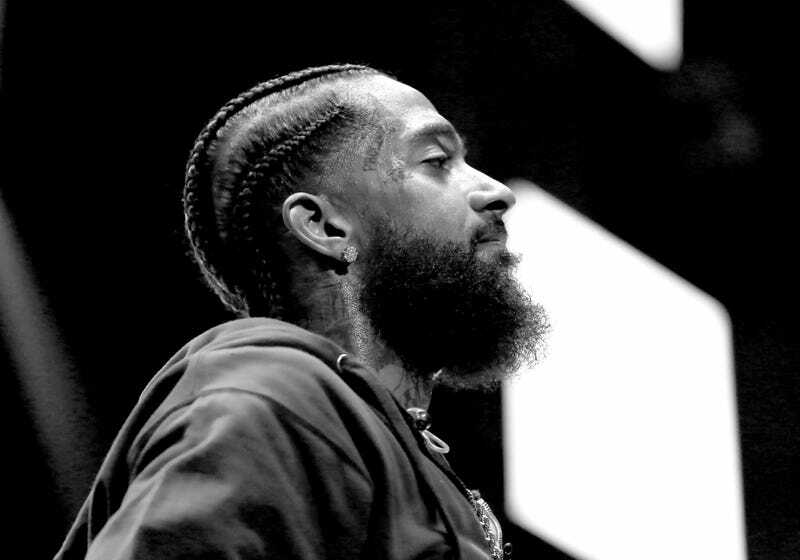 Nipsey approached life with a very trickle-up philosophy about community, ownership and empowerment, and he lived it. Here was a man who appeared to love his community, loved his woman and family, and eschewed common tropes of being from the hood. Only a man comfortable with who he is could and would do that GQ story and pictures with Lauren London. It was a great spread, but there was a time when that kind of thing could kill a career, when manhood was viewed only in its most base ways. Ironic, I know, considering his comments on gay men. It’s why many of us pray for growth. He imbued his music with those themes. Can’t lie, Nipsey’s music wasn’t all upliftment. It was, like many of the young hip-hop artists from Los Angeles (and everywhere really) caught up in and involved in the street life, littered with references and allegiances to their sets. But that’s natural; hip-hop, like politics, is local and sometimes the nation catches on. But even in song, Nipsey shared his philosophies on life and community, making him an artist who, while not a household name like others, was very well respected by all of his peers for his skill and his musical palette. Love him or hate him, he made good music that worked in your headphones or the whip. I don’t know why he was gunned down. I hope and pray he wasn’t still trying to break ties that wouldn’t let him go and it ultimately cost him his life. I don’t want to read that story in the news. I also hope some idiot didn’t just wake up on Sunday clout chasing and decided he needed a body. Nothing, not one single circumstance would make it better or OK. He is a man who is lost to the ether, leaving potential in the wake and a future that seemed so bright permanently dimmed. What comes of what he started? I only hope continued progress. What I do know is that hip-hop lost another artist, senselessly, and a change has to come. It gets exhausting to continue to have to talk about who these talented individuals could have become. It would be nice to be able to see some of these lives come to a natural, happy successful-on-their-terms conclusion.